Sept. 11, 2018 — A tight-knit community and strong mentorship components are two of Steven Johnson’s ’08 favorite things about Grinnell College. 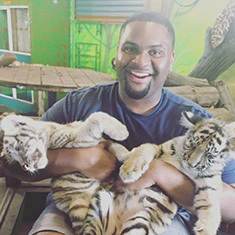 Johnson, a technical advisor for the Centers for Medicare and Medicaid Services in Baltimore, reconnected with his alma mater by taking part as a Fellow in the Grinnell Regional Admission Support Program. GRASP Fellows serve as an extension of the Office of Admission, acting as ambassadors of Grinnell College and promoting awareness of the institution. Growing up in Los Angeles, Johnson was unaware of Grinnell’s existence. That changed when he became a Posse scholar. Grinnell quickly jumped out as a college destination, and he’s thankful for what the College has taught him. Moving from New York to Baltimore without any strong ties really emphasized the importance of community to Johnson. Johnson studied sociology at Grinnell. He was a member of many of the student groups, held several campus jobs, and was very involved with the music scene during his time. One skill that has drastically been improved as a result of Johnson’s Grinnell College experience was his writing. Since graduating, Johnson has been very involved in training Brazilian Jiu Jitsu and Muay Thai (martial arts), mentoring children with mental illness, and most recently has been volunteering with the Meals on Wheels. When the opportunity to volunteer with GRASP came along, he knew he had to apply and get involved. It was the perfect opportunity to give back to the school that has meant so much to him. Johnson said helping with GRASP marries two things that he loves doing: writing and giving back. In addition to his GRASP activities, Johnson attempts to connect with fellow Grinnellians when possible. “As a person now in the real world, it is nice to connect with people who understand the world as it is and still continue to make a positive impact” Johnson says. He encourages fellow Grinnellians to give back to the College by making it an active part of their donations and actions. Learn more about Grinnell Regional Admission Support Program (GRASP) and how volunteers get involved.